Professional Membership for football players launched a few months ago is bringing great results and is proving to be a great tool for the transfer window activities. This post was updated on July 30th 2015. We’ve launched Professional Membership* in order to enhance transfer window activities and empower our users – especially those looking for new career challenges – with simpler and most importantly more efficient promotion to agents and clubs. Barely a month after launch, we were already seeing encouraging results. Players with Professional Membership are getting extremely high rate of attention and exposure through various ways (Players List, Profile views, email newsletters…). And the most essential thing: they are contacted by agents, scouts and club representatives, which is the the main incentive and a promise – we practice a 100% money back guarantee if a player isn’t contacted by an agent. We also give another promise: 100% increase of your profile views! 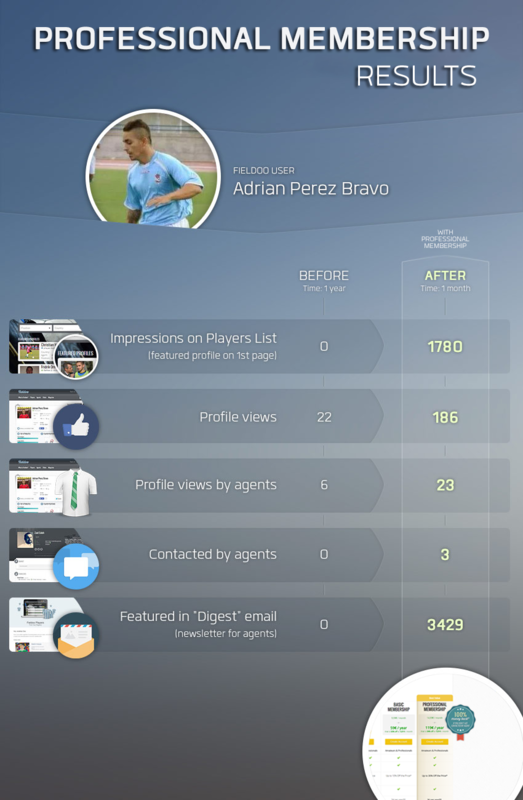 See below our before-and-after graphic comparison of Adrian Perez Bravo, Spanish footballer, who has Professional Membership. If you’re looking for a new club, getting our Membership is the first step. Of course, there is still more than enough time as majority of the countries will close its transfer window exactly one month from now (August 31). Professional Membership here. Adrian trialed with a professional team recently, you can read more about it here. *Professional Membership was previously named Transfer Window Package.